Toby Amodeo is a rising senior at American University, studying film and media arts. This Connecticut native has done the infamous Tough Mudder five times. When he's not shooting film, you can find him drinking coffee at the best coffee shop you didn't know about yet. 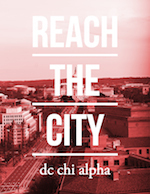 Chi Alpha often looks designed for freshmen and, in many ways, it is. 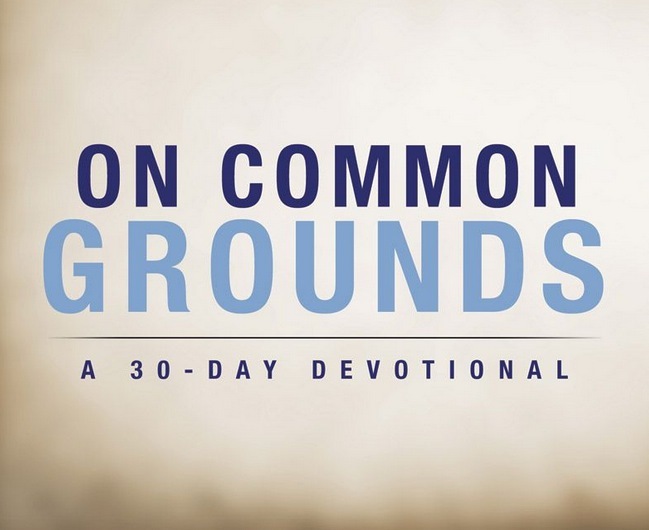 Speaking from experience, new freshmen are in a desperate search for new friends and will sign up for anything, even a faith community they know nothing about. But now, as a senior, I can look back and say both that I got a lot more than a friend group in Chi Alpha, and that I still have a place in this community even though I’m leaving it this year at graduation. Just because I’m a senior doesn’t mean I have it all figured out. In fact, most freshmen I meet seem to have their lives together more than I do. But beneath the surface, everyone is struggling with something. I was struggling as a freshman, even though I’d never admit it at the time. But because of some very brave and patient people, I became a part of a community that opens itself up, that recognizes that we’re not all okay. Chi Alpha invites me to take an honest look at myself and at faith, and it encourages me to open up to people I otherwise wouldn’t. Because of this, I’ve grown to recognize that faith is not about feeling good or the absence of pain. In fact, the most difficult times in my college experience all happened after I became a Christian during my freshmen year. I’ve seen both amazing seasons of deep community as well as a few periods when it would have been very easy to walk away from Chi Alpha and from faith altogether. But because of the friends and mentors I’ve had, I stuck with it. They’ve encouraged me to seek Jesus more honestly and earnestly, and that’s what’s kept me grounded in college. And now it’s my turn to help someone else struggling like I was. No, I’m not a small group leader, even though I’m a senior. But I am a part of this community. I’m not disqualified from caring about college students because I don’t go to the planning meetings. I’ve seen my major change three times (sorry, mom and dad), I’ve lost friends and made new ones, and I’ve made a series of good and bad decisions with my time at AU. But no matter my circumstances, I’ve always had someone in Chi Alpha supporting me, and I’m encouraged to develop my own role in the community. How can I not offer that to someone else? Freshman year, I thought that small group, church on Sundays and Thursday Night Worship were the goals. But as my faith develops and I grow in my relationship with God, I’m realizing that this is not the end. There are more students coming to American every year who look a lot like I did, not knowing that there is a God who loves them. There are so many people who think they have to prove themselves to find friends, who will never otherwise know that their identity can be placed in Christ if we don’t show them. What I’ve learned, I need to pass on. 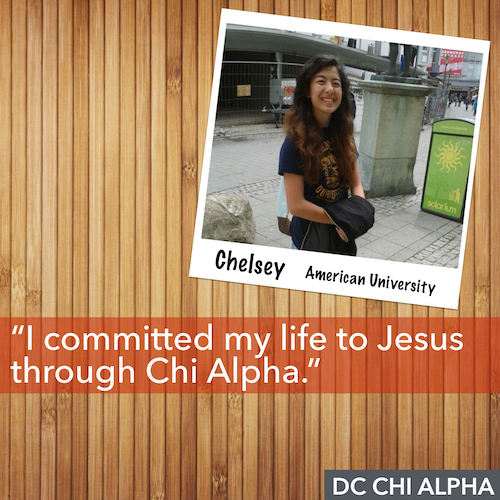 Chi Alpha is a whole lot more than a friend group or a ministry that reaches out to new students. It’s the place that taught me that the mission field is sitting next to me in class, that there is always room for one more, because there was room for me.